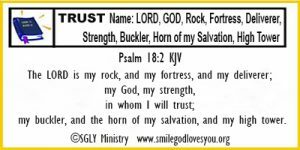 my buckler, and the horn of my salvation,and my high tower. Who is the LORD? This verse tells us He is more than enough for us. He is ALL we need every day, every night, in all situations. Knowing who the LORD is—we have to say in Him we will trust, we will rely on Him to be our All in All, for is truly is! Blessings to you as you walk with Him daily hiding His word in your heart and sharing it with others wherever you go.